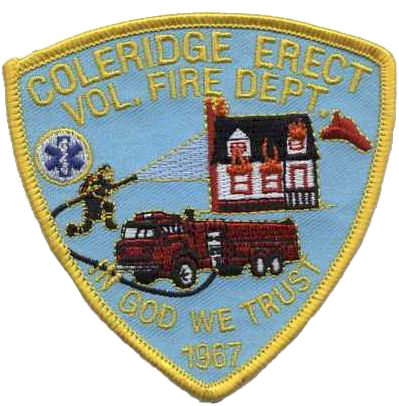 The Coleridge-Erect Fire District has received an improved rating of 6/9E, effective March 1, 2015, which should result in reduced homeowner insurance premiums for citizens living within 5 miles of its two stations. The new rating was issued by the N.C. Department of Insurance’s Office of State Fire Marshal. Coleridge-Erect Chief Keith Davis announced the improved rating of 6/9E to members at the department’s Christmas Party held Dec. 6. “They were tickled,” he noted about the reaction. He said the previous rating was 9E across the department’s entire 6-mile district. The new rating impacts homeowners’ insurance premium rates. The improvement should allow those within a 5-mile area of the department’s two fire stations to be eligible to receive reduced insurance premium rates. “They should see a fairly sizable reduction. The exact amount will be based on an individual’s insurance carrier,” Davis said. He explained that community support assisted the department in improving its rating. More property owners have signed agreements for use of their ponds as draft water sites for tankers to use in fighting fires in addition to the nine hydrants, along N.C. 22, in its coverage area. “We’re all working together for it,” Davis said about the new rating. The fire district serves a population of more than 3,600. The department was notified of the improved rating by Wayne Goodwin, N.C. insurance commissioner and state fire marshal. The new rating was based on a required state inspection of the department, performed every five years, as part of the N.C. Response Rating System. The inspections look at proper staffing levels, sufficient equipment, proper maintenance of equipment, communications capabilities and availability of water. The rating system ranges from 1 (highest possible) to 10 (not recognized as a certified fire department by the state), with most rural departments falling into the 9S category. State officials noted that, while lower rating don’t necessarily indicate poor service, a higher rating does suggest a department is overall better equipped to respond to fires in its district. Higher ratings can also significantly lower homeowners insurance rates in a fire district. State law requires the Office of the State Fire Marshal to inspect departments serving districts of 100,000 people or less, which account for all but six fire districts in North Carolina. Article published by Kathi Keys of The Courier-Tribune on December 8th, 2014.